Gabriela Ceballos (L) and Lorena Ibarra host "Telemundo en tu Casa." KGNS is expanding its Spanish-language news coverage with two daily newscasts to its Telemundo Laredo lineup. The Gray Television-owned station is adding an 11 am news and lifestyle program. Lorena Ibarra Martínez and Gabriela Ceballos anchor “Telemundo En Tu Casa,” named after Telemundo’s very first newscast in the Laredo market. 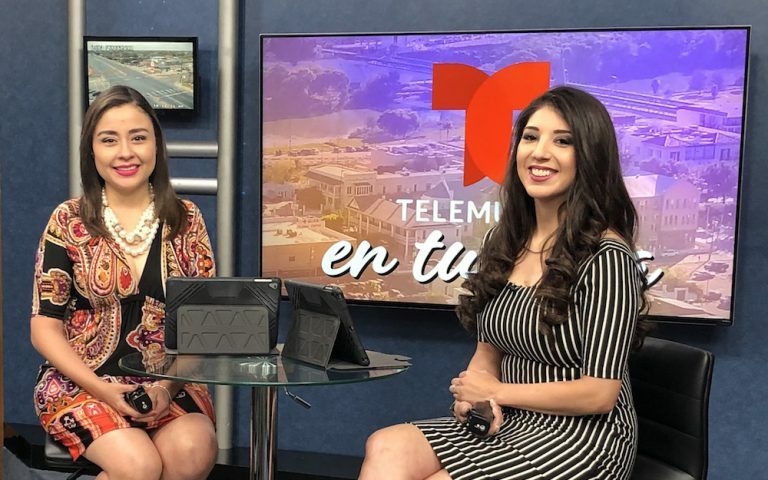 KGNS also launched “Telemundo: Primera Edición” at 4:30 pm, co-anchored by current evening anchor Miguel Amante and Ibarra Martínez, which leads into the 5 pm newscast co-anchored by Amante and Lupita Benavides. Both shows started airing Tuesday, April 2. See this right here is the Felicidad Aveleyra effect because of the launch of “Noticias Telemundo Mediodia” even non-Telemundo O&O stations are taking notice and launching their own versions of “Noticias Telemundo Mediodia” on the local level at 11am or 12pm depending on their time zone, just before the actual transmission of “Noticias Telemundo Mediodia”. We saw it in Wisconsin and now here in Laredo, I wonder which non Telemundo O&O station is next?